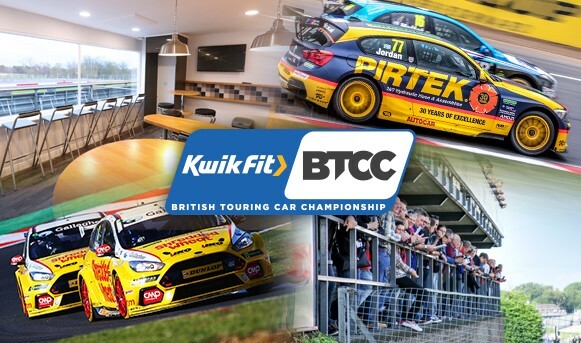 The Kwik Fit British Touring Car Championship heads to Donington Park on 28 April, and you can catch all the action with the best seats in the house, right in the heart of the action. Our VIP packages are available from just £123 including VAT. Donington's BTCC rounds are perennially among the best of the season. Very few circuits pose as much of a challenge to the drivers as Donington does, and the result is often spectacular. Watching the action trackside is one thing, but from the comfort of a warm, dry, and well-located suite with even better views of one of the key action zones is an entirely different prospect! Whether you're looking to entertain clients, or treating family and friends, raceday hospitality at Donington Park offers all guests an unrivalled day out, with first class facilities, outstanding catering and non-stop action on track. Our packages are detailed below, and our dedicated hospitality sales team can be contacted on 01474 875224 for all enquiries. We'd love to hear from you if you've any further questions - please contact Rob Corbel and Jarrod Stapeley on 01474 875 224 or email corpsales@msv.com for more information.